At the invitation of Premier Li Keqiang, Prime Minister Theresa May of the United Kingdom of Great Britain and Northern Ireland will pay an official visit to China from January 31 to February 2 and hold a new round of annual China-UK Prime Ministers' meeting. Q: Liu He, member of the Political Bureau of the CPC Central Committee and General Office Director of the Central Leading Group for Financial and Economic Affairs,delivered an address at the World Economic Forum Annual Meeting 2018 yesterday, reiterating the important propositions of promoting the rebalancing of economic globalization and building a community with a shared future for mankind as President Xi Jinping stressed in his address at Davos last year. Many commented that President Xi's address one year ago still matters a lot in resolving major issues the world is facing today. What's your comment? A: President Xi Jinping attended the World Economic Forum Annual Meeting and delivered a speech entitled "Jointly Shoulder Responsibility of Our Times, Promote Global Growth" last year, in which he expounded on the prominent problems confronting global economy, proposed a major initiative to promote the rebalancing of economic globalization and stressed the need to develop a dynamic growth model, an open and win-win cooperation model, a fair and equitable governance model and a balanced, equitable and inclusive development model. When the international community was bewildered as to where this world should be headed, President Xi's speech pointed out the direction, reassured the public and boosted people's confidence, demonstrating China's leading role as a major country in rising to the occasion and shouldering responsibility. One year on, President Xi's speech has been frequently quoted by leaders of states and heads of international organizations, producing a broad and far-reaching international influence. We have been following the Davos Forum these days. The theme of this World Economic Forum Annual Meeting is "Creating a Shared Future in a Fractured World", which is highly consistent with President Xi's major propositions of promoting the rebalancing of economic globalization and building a community with a shared future for mankind in his speech last year. Chair of the Forum Dr. Klaus Schwab also said that President Xi's speech at Davos is "an important turning point for China's relations with the world". 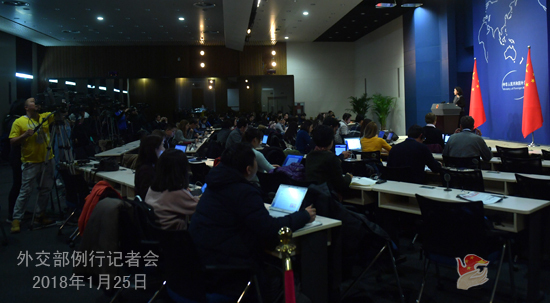 We also learned that many guests and media at this year's forum were still discussing President Xi's speech and speaking positively of its important significance. This fully shows that his speech is very inspiring and influential and that China's ideas, propositions and solutions are playing an indispensable leading role for the world today. We also noted that General Office Director Liu He reiterated President Xi's important propositions in his address yesterday, briefed on the major progress China has made in supporting economic globalization and expanding opening-up, stressed that China will always be the builder of world peace, contributor to global development and defender of international order and demonstrated China's firm determination to promote the building of a community with a shared future for mankind. We welcome all parties' efforts to make positive contribution to building an open world economy and promoting common development and progress of mankind in the spirit of wide consultation, joint contribution and shared benefits along with China. Q: According to reports, an anonymous ROK senior official told reporters on January 24 that the US suggested that talks with the DPRK are possible if the DPRK stops its provocation for some time, and now is the best time for it to talk to the US. The six-party talks framework is very important but difficult to resume for now. What's your comment on this? A: At the moment, there is a rare amelioration for the situation on the Korean Peninsula. 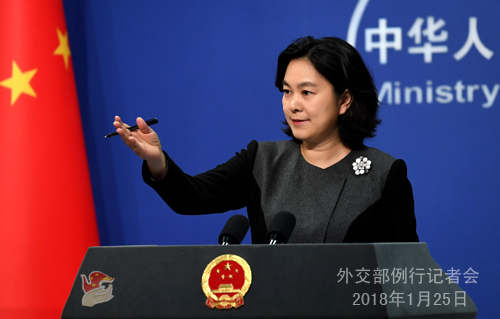 China believes that it is very important to carry on the positive momentum of inter-Korean interaction and turn it into a dialogue between the US and the DPRK at the right time. After all, the key to the Korean Peninsula issue lies in the hands of the US and the DPRK, the two directly concerned parties. We hope the two sides can work for the shared goal to seize the current window of opportunity and take an important step forward towards settling the issue through dialogue. You also mentioned the six-party talks. I would like to stress that the six-party talks have played an irreplaceable role in advancing the settlement of the Peninsula nuclear issue, and the principles identified in the September 19 Joint Statement are still of practical value and serve as a pragmatic guideline. We believe that the six-party talks are still full of vitality. Even though the six-party talks are now faced with some difficulties and challenges, we believe that no difficulties are insurmountable as long as all parties can build up trust, consolidate consensus and discuss solutions with wisdom in the spirit of mutual understanding and mutual respect. Q: According to reports, this week Russia has invited all permanent UNSC members as well as several other countries to attend a peace forum--Syrian National Dialogue Congress, which starts on January 29 in the Russian city of Sochi. Has China received the invitation for this forum? And if yes, could you provide any details about who is going to represent China in Sochi? A: China supports efforts that are conducive to easing the situation in Syria and promoting the political settlement of the Syrian issue. We hope that the Syrian National Dialogue Congress in Sochi will achieve positive outcomes. I have no information at hand regarding who on the Chinese side will attend this meeting at this moment. Q: Tomorrow is the Republic Day of India and India has invited leaders of ten ASEAN countries to attend commemorative activities. Some media think that India has invited these leaders in an effort to counter the influence of China in ASEAN and check on China's rising influence in the region. What is your comment? A: We have noted that in recent times, certain Indian media tend to associate every move of Indian government and leaders with China immediately. I don't know how the Indian government may think of this, but in my opinion, it reflects that those Indian media with such opinions and speculations are too unconfident about their countries and distrustful of China. 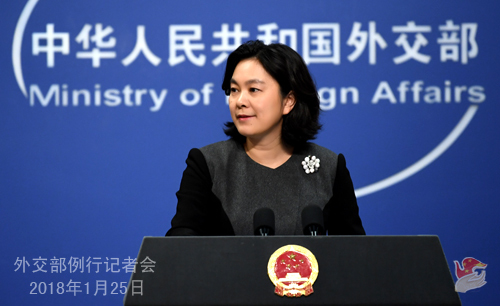 China remains open to and welcomes the development of normal cooperation and relations between any two countries. We are pleased to see the development of normal relations and cooperation between Indian and ASEAN countries, and we hope to work with others to make positive contributions to promoting regional peace, development and prosperity. Q: The US Treasury Department announced sanctions on DPRK-related entities and individuals, including two Chinese entities. Is China going to react on its own information to take actions against the DPRK organizations or individuals that are operating illegally in China? A: I would like to reiterate that the Chinese side has always been comprehensively and strictly implementing the UN Security Council resolutions on the DPRK and our efforts are there for all to see. At the same time, we firmly oppose any country's imposition of "long-arm jurisdiction" on Chinese entities or individuals under its domestic laws. As for whether the relevant enterprises have violated the resolutions of the Security Council or Chinese laws, I'm not aware of the specific case by far. However, as I stressed many times, it is very clear that if any enterprises or individuals are found engaging in activities that violate the resolutions of the Security Council or Chinese laws and regulations on the territory of China, the Chinese authority will handle the cases in strict accordance with the law. Q: First, according to reports, based on a year-long investigation, the US Congress says that it is easy to buy fentanyl and other illicit opioids online from Chinese sellers and have them shipped to the US by mail. Does China agree that it is the main source country for the illicit opioids such as fentanyl? What has China done to stop such shipment? Second, the Congress also said that the preferred method for shipping such illicit goods from China is express mail service (EMS), which delivers parcel through the US postal service. They urged China to do a better job at collecting information about packages sent to the US, including sender information and description of contents. Why do so many packages, some containing lethal drugs, enter the US without identifying information from China? What solution does China suggest? A: I am not aware of the specific details, but I can give my response in principle. Anti-drug cooperation is one of the highlights of China-US law enforcement cooperation. In recent years, the two sides have conducted some highly effective cooperation on cracking down on cross-border drug-related crimes and advancing psychoactive substance listing and control, which has won wide approval from the public of the two sides. China's attitude on this issue is very clear. We stand ready to deepen cooperation with the US side, strengthen anti-drug communication and coordination, positively and effectively address this issue together with the international community to ensure peace and security of the whole world. Q: According to reports, the US Treasury Secretary said that he welcomed the current weakness of the US currency which hit a three-year low yesterday. Is China worried that the US may be manipulating its currency? A: We hope that all countries could formulate their exchange rate policies in a way that is responsible and conducive to world economic stability. Q: An official of the US administration said that China has been superb at free trade rhetoric, and even more superb at highly protectionist behavior. What is your comment? A: First of all, I must make it clear that there is simply no reason at all to accuse China of trade protectionism. Take a look around today's world, who is advancing protectionism, applying international rules in a selective way, lopsidedly elevating its national interests above all else and following a beggar-thy-neighbor policy? I believe everyone knows the answer only too well. Chinese leaders have on many occasions declared that China's door to the outside world remains open, and it will only open wider. That is because only by keeping the door open can there be a smooth way for China and the rest of the world to have two-way exchanges. You may have noticed that at the end of last year, China took some concrete efforts to significantly broadened access to its financial markets. Yesterday, Liu He, member of the Political Bureau of the CPC Central Committee and General Office Director of the Central Leading Group for Financial and Economic Affairs, also reassured the world at Davos of China's determination to continue opening up, expanding market access, and upholding multilateralism and multilateral trading system. We believe that China's major reform and opening-up measures, both existing and forthcoming ones, will create a broader space for the mutually beneficial cooperation in the economic and trade fields between China and the rest of the world including the US. I also want to stress that China's development is the world's opportunity. The sooner you recognize this fact, the sooner you come to share dividends from China's rapid development. I would like to reiterate that China, with open arms, welcomes all countries to take a ride on the express train of China's development. It also goes without saying that China will take all necessary measures to resolutely safeguard its lawful and legitimate rights and interests. Q: You just announced British Prime Minister's upcoming visit to China. Do you have more information on that in terms of the schedule and China's expectation of the visit? A: The year of 2017 marked the 45th anniversary of the establishment of China-UK ambassadorial diplomatic ties, and it was also a year of in-depth development of the Golden Era of China-UK relations. During their meeting at the sidelines of the G20 Hamburg Summit, President Xi Jinping and Prime Minister Theresa May reached important consensus on developing the China-UK relations in the next stage. Premier Li Keqiang and Prime Minister Theresa May also exchanged congratulatory letters with each other on the 45th anniversary of the establishment of diplomatic ties at ambassadorial level, reaffirming their shared aspiration to develop bilateral relations. This visit marks the first annual China-UK Prime Ministers' meeting following President Xi Jinping's historic state visit to the UK in 2015, when the two countries announced the launching of the China-UK global comprehensive strategic partnership for the 21st century and the Golden Era of China-UK relations. It is also Prime Minister May's first official visit to China after she took office, thus of important significance to the development of China-UK relations. During the visit, Chinese leaders will meet and hold talks with Prime Minister May on separate occasions and exchange in-depth views on regional and international issues of mutual concern. Prime Minister May will also visit Shanghai and Wuhan, Hubei Province. China highly values its relations with the UK. We hope to, taking this visit as an opportunity, further step up the political mutual trust and expand across-the-board mutually beneficial cooperation between the two sides and achieve new development of the China-UK global comprehensive strategic partnership for the 21st century.